Marketing Melodies and digital agency WeAreDigital has unveiled an app which allows retailers to subscribe to an in-store music service called StorePlay. StorePlay represents an evolution in how digital agencies are developing utility-based platforms for clients rather than just one-burst campaigns. StorePlay was officially launched last night in Melbourne after a trial period. The app counts among its initial clients Palace Cinemas, Karen Millen, Ladro Pizzeria and The Italian Restaurant. 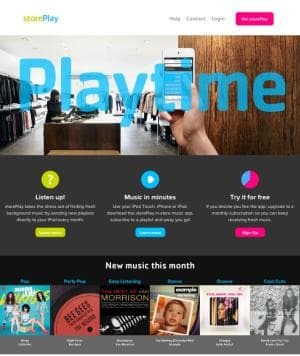 Retailers pay a monthly subscriptions fee, available across different pricing levels, which allows them to download musical content based playlists. StorePlay is purportedly the first app of its kind globally. StorePlay has licensing deals with major and independent labels including EMI, Sony, Warner and Universal. The app is compatible with iPhone, iPad, iPad Mini and iPod Touch. Retailers will still need to pay yearly licence fees to the Australian Performing Right Association (APRA) but depending on the playlist selection, they may be able to avoid licence fees to the Phonographic Performance Company of Australia (PPCA). Additionally, the StorePlay interface allows companies to pay their APRA and PPCA fees within the system, integrating the process into the app. A new app called StorePlay will allow retailers to subscribe to an in-store music service.